Acting media program director Fo Wilson has co-curated Ekphest: a Festival of Art + Word with InterArts alumna artist & poet Krista Franklin. 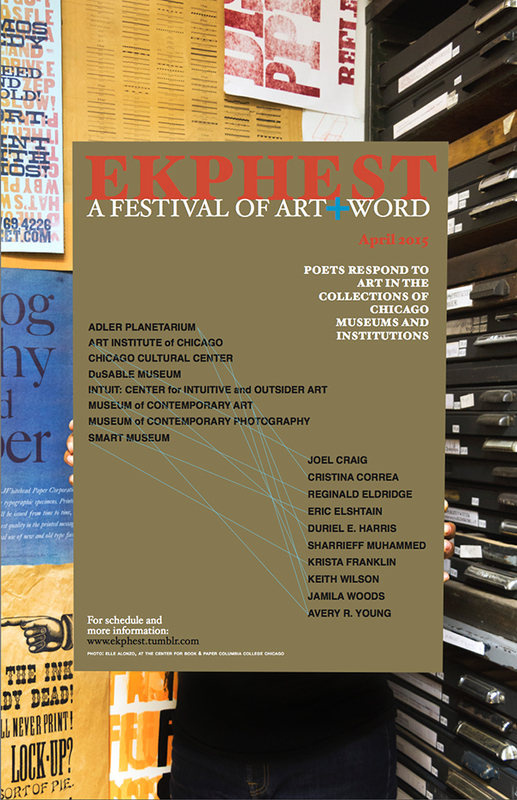 Ekphest: a Festival of Art + Word is happening throughout the month of april in honor of national poetry month. It pairs nationally recognized chicago poets with chicago museums and institutions as they read and perform original work created for the festival inspired by their collections. Several events have happened so far, but there are others at the Smart Museum, MoCP, the Adler Planetarium, the MCA and the DuSable Museum of African American History in the next few weeks. Jamila Woods will read from her work inspired by Lorna Simpson’s “Flipside, (1991),” as a part of the museum’s MCA Live programming. She will be joined by Fatimah Asghar and RJ EL of the Young Chicago Authors’ Teaching Artist Cohort who will read poems inspired by the Doris Salcedo exhibition currently at the museum running through May 24. The event is free with museum admission or to Illinois residents. Inspired by the painting, “Lincoln Speaks to Freedmen on the Steps of the Capitol Building, 1863,” local Chicago teens will write responses to the questions: “What did it mean to be a teen in 1863? What does it mean to be a teen today?” The evening includes a powerful performance by young, and the responses from the teens through an open mic session. Referencing “Presidential Moon, 1969 (from the Anachronic Series)” by photographer Adam Schreiber, Elshtain will present a short performance of poems centered around the image of the moon, the amplified sound of typewriter keys, and the human voice. The photograph by Schreiber is of a sculptural representation of the moon housed in the basement of the LBJ presidential library. In collaboration with Mikey Peterson, a Chicago-based video-audio artist, Elshtain’s presentation includes sound and film as the poem asks: What can a little moon do for you?